Camping Domaine de Labeiller delivers a luxury camping experience surrounded by nature. This magnificent campground boasts a stunning water park and convenient services. The holiday camping site provides you with all the comforts of an exclusive resort. Situated in Saint Victor de Malcap, Camping Domaine de Labeiller is close to the Roman town of Nîmes. 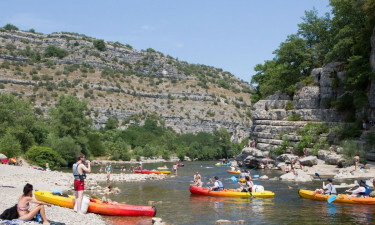 The fabulous holiday camping destination is also at the doorstep of the Ardèche, a stunning natural and cultural wonderland with authentic villages and beautiful landscapes. Book your next camping holiday at this luxury destination with LuxCamp today! Why Choose Camping Domaine de Labeiller? 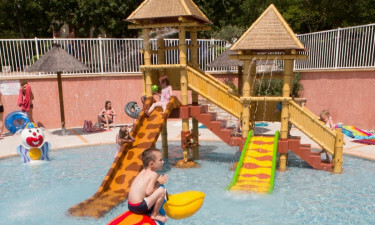 Great facilities and family-friendly activities ensure a memorable stay at Camping Domaine de Labeiller. Bike trips, hikes, canoeing and kayaking, and other fun activities help keep campers of all ages entertained. A private tree-lined pond also gives you a tranquil spot to fish close to your accommodation. Surrounded by olive trees and embraced by the scent of lavender, the holiday camping site’s large water park is a fun spot to enjoy the sun and water. You can swim in the sprawling pool or relax in the Jacuzzi. There is also a children’s play area and wading pool plus a waterslide. Fantastic services ensure you have a comfortable stay at this luxury camping site. A multi-sports ground is a great space for football, volleyball or basketball. Internet and mail services are available at the reception, and there is a shop with snacks and other essentials. The campground also has modern bathroom and laundry facilities.